When it comes to increasing your operation’s productivity, Technical Packaging Systems offers a wide range of products, including palletizing robots and pick and place robots from FANUC America. We understand that it is essential to eke out every possible advantage against your competitors and, as a result, work with the industry’s most trusted manufacturers to deliver consistent, high-quality products that will reshape the way you look at your operation. No matter what operational stage you’re looking to optimize, you can be confident that our team has the tools, knowledge, and experience necessary to make it happen. In today’s post, we’re going to look at a couple of the robots that we offer from FANUC America. FANUC America’s palletizing robots are designed with optimization in mind. Equipped with iRVision and capable of up to 30 cycles per minute, they are a rugged, rock-solid, and dependable way to boost your operation’s productivity. 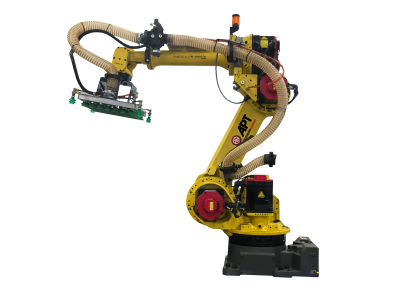 With a wide variety of customizable solutions available, FANUC America offers the industry’s broadest range of palletizing robots. Engineered with repeatability and precision in mind, FANUC America’s pick and place robots have earned a reputation for their innovative designs. With the aim of enhancing efficiency, Technical Packaging Systems can work with you to determine the most beneficial model for your operation. At Technical Packaging Systems, our primary goal is to help our customers produce their products faster and more consistently. Whether you’re in the pharmaceutical industry, the transportation industry, or anything in between, you can be certain that our team can give you a leg up on the competition. If you’re searching for a material handling specialist that will work with you to understand – and optimize – your operation, contact us today to discuss how we can help.